Before I went on vacation two weeks ago, I have about 3 pound potato and I'm glad it's still good when I get back I don't like to waste the foods, So I use them right away, I made wasabi mashed potato to serve with seared mahi-mahi glazed with mango coconut sauce and sauteed napa cabbage and carrot,They are perfect together as a dinner meal. mash potato with potato masher and stir until all ingredients combine. I serve with seared mahi-mahi and sauteed sesame ginger napa cabbage ,those two recipe will be in the next blog post soon . Interesting, interesting, both the wasabi and mahi-mahi. I just made mash last weekend and wish I have seen your recipe. I have a tube of wasabi at home, ok maybe can be done this week. Such a lovely meal! I have had wasabi only in small doses (as in nuts) so this is new to me. What a great idea! My husband and I both love wasabi and mashed potatoes so this is the perfect combination for us. Ridwan, what time is dinner?...but of course I missed it! I have a small jar of wasabi powder that I haven't even opened yet, always have mayo on hand, and of course the potatoes. 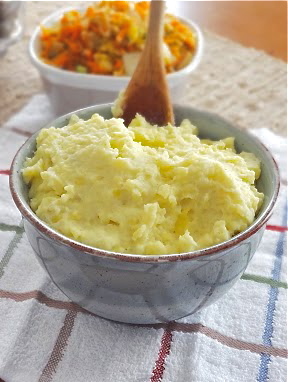 My next project will be your delicious mashed potato recipe! I know those mashed potatoes rocked your taste-buds... what a treat! !